Monticello was the estate of Thomas Jefferson, third president of the United States and author of the Declaration of Independence. The distinctive neoclassical building of the main house was designed by Jefferson himself, and he continued to improve and add to it throughout his life, over a period of 40 years. Jefferson died with massive debts, forcing his children to sell of most of the furnishings, and then the plantation itself. The house itself, made up of 43 rooms, is furnished with a blend of the original furniture and period pieces. 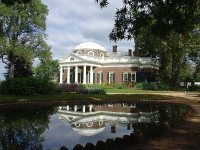 Jefferson's time at Monticello is surrounded by controversy regarding his treatment of his slaves, and particular relationship with one named Sally Hemings. Monticello has several multimedia exhibitions that deal frankly with the president's slave ownership, and archaeologists are constantly researching the subject. The outbuildings and gardens are all open to the public, and offer some stunning sights with beautifully-cultivated flower gardens filled with cabbage roses, foxglove, lilacs, and more. The gardens are also home to the Center for Historic Plants, a project started by Jefferson himself. Admission: Day Pass and House Tour: $29 adults, $10 children, other packages and concessions available.